Oh a thing i’d forgotten to mention, Our hotel stay included breakfast so we had to go to the breakfast room which was on the top of the hotel. It was a terrace with large windows. It was beautiful to go in the morning and see the Bosphorus and Istanbul looking sleepy with mist around. Like wayward sheep, we were all collected and driven towards the Dolmabache Palace where people were again shepherded into different buses as per the tour they had opted for. But there was no problem for us we stayed in the same bus. Along with us were some people who were German and needed a German guide. The English people included us, some people who were from a cruise that was taking a halt at Istanbul and some people who had opted for the Full Day Tour. This Church happens to be situated in a place which needs the driver to drive through narrow lanes. Squiggling through the narrow lanes we reached the Church. The guide Aziz had already got us tickets. There were a lot of people from South Korea and Japan as well as from Germany because they had translators with them. 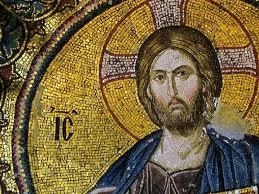 The mosaics in this Church had 3 layers which we discovered when we saw a damaged mosaic of Christ. Also, the people during the Greek civilisation had used a technique to split up a piece of marble so that there was an exact mirror image in a tile. So there were 2 marble pieces which had the same pattern looking like a mirror image. It seemed that this technique took them 2-3months to do. We found out that in these mosques, there was always a SOUP KITCHEN. In these kitchens, food was served to the poor and hungry. After a sumptious lunch at Ozler, we retired to 203 because it had started raining. Spring as in all countries is marked by bare, leaf-less trees and newly blooming flowers. It is also marked by uncharacteristic rains and gloomy, cloudy skies. Travellers to London during the months of April and May will add that the gray skies (=How is it spelt again grAy or grEy..does it make a difference?) oh yea gray London skies add to the gloom. Yea so we went out on our own exploring Istanbul. 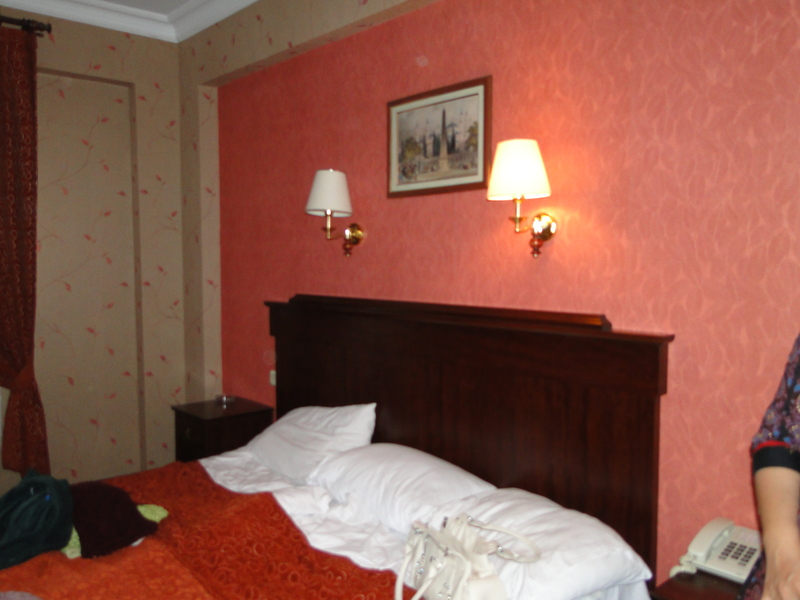 Inquiries made at the reception yielded that the Topkapi Palace or Topkapi Sarayi is just 5 minutes from the hotel. So we headed out to explore. But first things first. Thirsty explorers never make good writers or reporters. Water. From where but?? In a place with scant traces of English that too!! Well we’d just landed in Turkey on a sunday so we were caught without any Turkish lira on hand. The people at the reception informed us that most change offices were closed on Sunday and it was better to get Euros changed there as compared to a bank because banks charge more commission. So we didn’t have Lira to pay the Convenience Store lady. 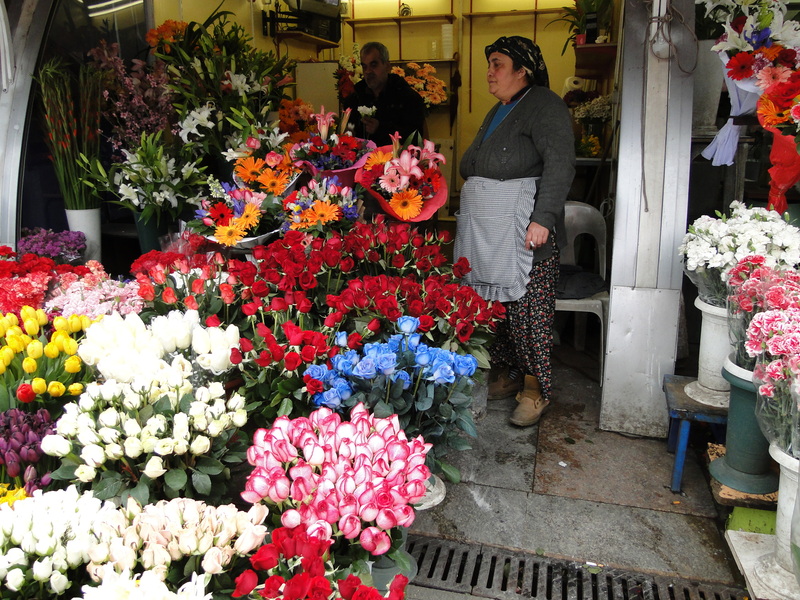 But she accepted euros and gave us change in Lira (=At a low exchange rate of 2TL per Euro). So we got our first Liras in hand. Then we walked out to the main street where we saw tram lines and a tram station (=Gulhane Park). Also we could see that the skies had lifted. Right in front of us were the walls of the Topkapi Palace. It has been beautifully maintained because the Palace looks like its been cut out from another era. Also there were lot of pansies and tulips planted everywhere so the sidewalks were green and pretty. 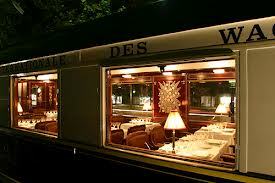 We passed quite a few restaurants with their Menu’s displayed out and had a sales rep some out and try to bring us in. But on learning that we were not going to eat there they left us with their menus. The road to Hagia Sophia turns up the hill from the Topkapi Palace. On that way there were hotels, restaurants and shops selling leather items. My sister loved a goatskin jacket but its of no use in a place as hot and humid as Mumbai. But we did have our first encounter with Turkish Kebabs (=Which are known as ‘Kebaps’). They don’t cook it the way we do in India. They have a whole load of meat on a skillet (=a stick…i love the fancy names) which keeps turning in circles. On one side is a coal-oven type thingie so the meat gets cooked in coal and gets a smoky flavour along with the juices and marinade which makes the whole thing way too tasty. When a side has browned enough, the Chef cuts pieces off (=just shaves the top layer off) and then it is served in different ways. Also we found a change office that was open so we changed Euro to TL. There were more restaurants, shops selling tourist souvenirs, magnets, trinkelts etc etc. But we skipped all of that and came to the Sultanahmet Square where we entered the ‘Aya Sophia’. Giving a lot of information about the Aya Sophia is not necessary. So i’ll be detailing about the main things. Aya Sophia was constructed as a Greek Orthodox Church in the year 360 during the rein of Emperor Constantinius. Due to riots in subsequent centuries, the church was burnt down twice. Also it had been destroyed by earthquakes, as a result of which many parts of domes were destroyed. 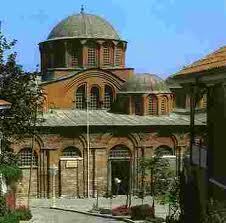 The second church was commissioned by Emperor Theodosius II. During the subsequent periods the walls were used to make Mosaics. During the Iconoplastic period, any Mosaic was supposed to be a form of idol worship. So Mosaics were destroyed or plastered over. In any case most of the Mosaics have stayed on for centuries pointing out to the artistic brilliance of those ages. A Mihrab is something that is seen in all Mosque-Museums in Turkey. Islam believes that when Muslims pray, they should pray in the direction of Mecca. So a Mihrab is constructed pointing out the direction of Mecca. The Mihrab is superbly decorated with calligraphic inscriptions. In the 16th century the sultan Suleiman the Magnificent (1520–1566) brought back two colossal candles from his conquest of Hungary. They are the two pillar like posts adorning the Mihrab. In earlier times, the Sultans used to pray along with the common folks coming to the Mosque. But with the spread of territories and Islam, the number of followers increased thus necessitating a special chamber where the members of the Imperial Family could pray. The outer marble has been done up delicately with intricate carvings of metal which has been illuminated brilliantly by the Museum authorities. The Minbar is a raised speaker’s stand where an Imam (=Leader of prayer or priest) stands to deliver sermons. It is also a symbol of authority.The Minbar is usually shaped like a small tower with a pointed roof and stairs leading up to it. The Deesis Mosaic shows Christ along with Virgin Mary and John the Baptist on the Judgement Dayshowing the pain and suffering of the humans. It is the most destroyed of the Byzantine Mosaics with 3/4th being heavily damaged but is significant for the expressions on Mary and John’s faces. There are many mosaics of Virgin Mary and Christ especially one at the entrance. There are also Mosaics of the various Emperors and Empresses making donations to the Church. Significant among these is is the Mosaic of Empress Zoe because she had many marriages and thus the face of the husband in the Mosaic kept changing!! 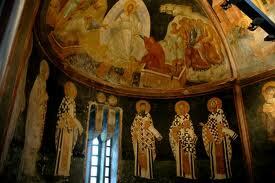 (=Talk of keeping up with the times).There are also Mosaics of various priests. The Hagia Sophia Library is a sight in itself. It is said to have held more than 20000 scrolls and writings. Also the unique architecture is such that it allowed the Architects to put in forty windows around the base of the dome. Hagia Sophia is famous for the mystical quality of light that reflects everywhere in the interior of the nave. There are also inscriptions from the Synod period dated 1166 as well as a Sarcophagus (=A funeral case for the corpse) of St Irene. There are underground Cisterns that used to supply water when needed. There is an Imperial Fountain where ceremonies used to take place. It is beautifully decorated. There is a ‘Medresse’ or a religious school where children are trained to be Imams (=I hope i’m getting it right. So after this hugely historical tour we photographed the tulips and rested our tired legs. Then we returned the audio guide (=We need our passports back!!) and made our way to the Basilica Cistern. the brilliant tactical move of converting places of worship into centres of knowledge.